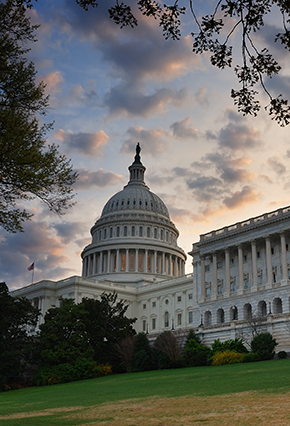 As the lapse in appropriations for the federal government enters its third day, it appears that significant curtailment of federal activities may continue longer than initial indications from congressional leadership and the White House may have suggested. With the federal government’s ability to borrow money scheduled to reach its limit on October 17th, the debate over the debt ceiling is likely to be joined with the debate over funding the government. If the government were to re-open following a resolution of funding for FY2014 without a resolution of the debt ceiling issue, an impasse over increasing the debt ceiling could lead to a second government shut-down. The shut-down has many practical effects including limiting access to public buildings and national parks and triggering the cancellation of many congressional hearings and public events on and around Capitol Hill. The U.S. House Administration Committee has issued guidance on what portions of the Capitol complex are open to the public while maintaining minimal operations. This guidance sets forth the access points for House congressional office buildings during the shut-down. Since each Member of Congress and each congressional committee has their own contingency plan for the shut-down, anyone with previously scheduled meetings or hearings on Capitol Hill should contact the meeting participants or committee conducting the hearing for guidance. For additional information, see our recent update dated October 1, 2013. Our updates will be cumulative in nature. Each update will focus on new information about the shut-down status of a federal department or agency either that has not been the subject of our previous updates or for which there is new information. A complete list of the contingency plans and shut-down status of all federal departments and agencies that we have reviewed may be found at http://www.vnf.com/news-media-federal-agency-shut-down-status.html. Army Corps Of Engineers (NEW). Some functions of the Army Corps of Engineers will remain open while others have ceased for the duration of the lapse in appropriations. All active duty military personnel are exempt from shut-down procedures and will remain on the job. In addition, essential functions will continue and are defined to include: operation of the Emergency Operation Center; operations and maintenance of hydropower plants, commercial locks, and flood control projects; and emergency response work. Contractors who have been fully paid may continue working; contractors who have not been paid may only work on essential activities. Contact Alan Mintz for further details. Bureau of Land Management (BLM) (NEW). The BLM, a branch of the Department of the Interior, has halted nearly all activities except law enforcement and emergency response (including limited staff for wildland fire suppression). Processing of oil and gas drilling permits, onshore mineral leasing sales and authorizations, right-of-way and other use permits, and other non-emergency activities are suspended. Oil and gas inspection and enforcement activities will continue to the extent necessary to protect life and property. Operators of pipelines and other facilities on existing rights-of-way or pursuant to other existing authorizations are permitted to continue operating, unless there are compliance issues that may result in damage to government property or threat to public safety. All visitor centers and facilities will be closed, as will campgrounds, other recreation sites, and the BLM’s National Recreation Reservation System. Six-hundred employees (5.5% of BLM’s total) will continue working as exempt personnel, and 550 employees will remain on-call for emergency services and other critical functions. Exempt staff includes those working on helium operations, Alaska pipeline-related activities, and certain right-of-way monitoring and compliance activities. Contact Jonathan Simon or Joseph Nelson for further details. Centers for Medicare & Medicaid Services (CMS) (NEW). CMS will continue most Affordable Care Act activities including coordination between Medicaid and the Marketplace, insurance rate reviews, and assessing the percent of premiums spent on medical services. Medicare will not be disrupted significantly. CMS will use existing FY2013 appropriations to fund states for Medicaid and CHIP. Contact Nancy McNally for further details. Centers for Disease Control and Prevention (CDC) (UPDATE). CDC will continue essential services at significantly reduced capacity, including responding to outbreak investigations, processing lab samples, and maintaining the 24/7 emergency operations center. CDC will continue programs funded outside the normal appropriations process including World Trade Center health program, PEPFAR, the Global AIDS program, and the Vaccines for Children program. CDC will not continue other programs including the annual influenza program, updating disease treatment recommendations, and technical assistance to support state and local partners in disease surveillance. Contact Nancy McNally for further details. Commodity Futures Trading Commission (CFTC) (UPDATE). CFTC announced on October 1 that it will not publish public reports such as Cotton on Call, Commitment of Traders and the Bank Participation Report during the government shut-down. However, the Commission reminds affected parties that compliance with all mandatory filings is required. Contact Lisa Epifani for further details. Department of Energy (DOE) (UPDATE). While DOE’s contingency plan states that the Department has sufficient prior appropriated funds to remain open for the time being, the Department’s website is not currently being updated. Please contact DOE directly if you have specific questions about continued operations of particular offices during the lapse in appropriations. Contact Doug Smith for further details. Environmental Protection Agency (EPA) (UPDATE). EPA is not updating their website with additional information about closures. Please contact EPA directly if you have specific questions about continued operations during the lapse in appropriations. Contact Kyle Danish for further details. Fish and Wildlife Service (FWS) (NEW). FWS, a branch of the Department of the Interior, will maintain sufficient staff to serve as animal caretakers at hatcheries and captive breeding facilities, safeguard life and property at wildlife refuges, and provide law enforcement and emergency services including fire management. Additional personnel will remain on call in case of a large-scale incident. All public facilities will be closed. FWS has not indicated overall staffing numbers. Contact Jonathan Simon or Joseph Nelson for further details. Food and Drug Administration (FDA) (NEW). FDA will continue operating components funded by user fees rather than appropriations. FDA will also continue essential activities including emergency consumer protection services, high-risk recalls, civil and criminal investigations, and import review. The agency will not operate the remainder of its food safety, nutrition, and cosmetics activities including routine inspections, import monitoring, notifications and most laboratory research. Contact Nancy McNally for further details. National Oceanic and Atmospheric Administration (NOAA) (UPDATE). NOAA has taken down itsmain agency webpage and most of its associated webpages. The National Weather Service’s website, Weather.gov, will continue to be updated throughout the government shut-down. Contact Jon Simon for further details. National Park Service (NPS) (NEW). The NPS is a branch of the Department of the Interior. Under NPS’s shut-down plan, all park grounds, visitor centers, hotels, campgrounds, and park roads—other than through roads—are being closed. All concession facilities and commercial visitor services are required to close on October 3, and all permits for special events in units of the national park system have been rescinded. Work will continue in each of NPS’s regions with respect to emergency medical care, law enforcement and disaster assistance, border and coastal protection, activities necessary to ensure production of power and maintenance of power distribution, and protection of federal property within the park system. More than 20,000 NPS employees (87%) have been furloughed, while approximately 3,000 will remain working, absent an emergency, during the shut-down. The closure of the national parks has emerged as one of the most visible and widely felt immediate results of the shut-down, with direct and significant impacts on the many businesses that provide or support visitation to the parks, and their employees as well as US and foreign visitors. Contact Jonathan Simon or Joseph Nelson for further details. Nuclear Regulatory Commission (NRC) (UPDATE). NRC will continue to operate for at least one week largely unaffected by the government shut-down using carryover funds from FY2013. However, interested parties have inquired why NRC would have to shut-down since fees paid by licensees fund much of the Commission’s operations. Responding to questions on the NRC’s blog, the Commission’s Chief Financial Officer explained that fees paid by licensees cover only 90% of NRC’s budget and all fees paid by licensees are paid into the U.S. Treasury, and then appropriated by Congress to the Commission. Contact Mike McBride for further details. Rural Utilities Service (NEW). The Rural Development office of the USDA will keep only 1% of its staff (53 employees) working during the shut-down. The Rural Utilities Service will be completely shut down, with no staff excepted. During the shut-down, no additional loans or grants will be available, except for emergency purposes; this includes any loans or advances for modernizing electric infrastructure. Although the Rural Energy for America Program is funded via no-year appropriations, it will not continue operating unless required to preserve USDA property. Contact David Yaffe for further details. Securities and Exchange Commission (SEC) (NEW). Based on prior year appropriations and funding outside of the appropriations process, the SEC remains open during the current lapse in appropriations. If the lapse continues for an extended period of time, the SEC may be forced to curtail operations. In that case, the following activities will be continued despite a lack of funding: emergency law enforcement/litigation matters including temporary restraining orders, time-sensitive investigations, and online complaint systems; maintenance of online filing system EDGAR; and limited market monitoring and surveillance. SEC anticipates this will require 147 of its 4,149 staff. Other functions including processing of filings, rulemakings, non-emergency litigation, and routine oversight, will not be continued. Contact Lisa Epifani for further details. Surface Transportation Board (STB) (UPDATE). The STB announced on its website that all deadlines for the submission of material to the Board will be tolled for the duration of the lapse in appropriations. Contact Mike McBride for further details. U.S. Forest Service (USFS) (NEW). The USFS is a branch of the Department of Agriculture. During the shut-down, it will continue certain activities to protect life and property, including fire suppression, law enforcement, natural disaster response, and protection of federal facilities. All USFS-operated developed recreation areas are closed; general areas and concessioner-operated facilities generally remain open for the time being. USFS estimates that staff will be furloughed over several days, until 41% of its staff (13,260) remains working in these excepted activities after day 5 of the shut-down. Contact Jonathan Simon for further details.